Findings from a new mouse study suggest that treatments that increase levels of the protein thrombospondin-1 could help the liver recover from an overdose of acetaminophen. Acetaminophen—a commonly used pain reliever and fever reducer—is the leading cause of quickly developing, or acute, liver failure in the U.S. Findings from a new mouse study suggest that treatments that increase levels of the protein thrombospondin-1 could help the liver recover from an overdose of acetaminophen. "The only treatment available now for acetaminophen overdose must be administered early, before significant liver injury occurs," said Matthew McMillin, Ph.D., who performed the research. "We are working to identify new drug targets to improve treatment options and reduce the need for liver transplantation, which is often the only option for patients with acute liver failure due to drug toxicity." McMillin, an assistant professor at the University of Texas at Austin and research biologist at Central Texas Veterans Health Care System, will present the research at the American Society for Investigative Pathology annual meeting during the 2019 Experimental Biology meeting to be held April 6-9 in Orlando, Fla. McMillin and his colleagues found that mice with acute liver failure from acetaminophen toxicity had higher levels of thrombospondin-1 than mice with normal liver function. When they administered acetaminophen to genetically modified mice that lack thrombospondin-1, the liver injury and loss of liver function was more severe compared to unmodified mice. The researchers also observed impaired liver regeneration and increased cell death in the mice without thrombospondin-1. "Our study is the first to investigate thrombospondin-1 during acetaminophen toxicity," said McMillin. "We were able to identify cell communication pathways that do not work properly during acetaminophen-induced liver injury and thus lead to worse outcomes." Next, the researchers plan to give mice different drug treatments that manipulate thrombospondin-1 to find out which treatment might be suited for potential clinical studies. 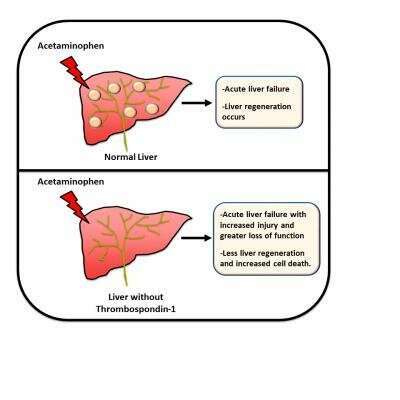 They also plan to examine patients with acetaminophen-induced acute liver failure to determine if their thrombospondin-1 findings from mice hold true in people.